Ah, sweater knits! These highly textural, stretch fabrics can be cozy, lacy, casual, or sophisticated. With a good sweater knit and a little practice, you can cut and sew a sweater in a day or less, even if you can't knit or crochet. Yes, they’re enabling. And they’re beautiful. If I sound a little biased, well… full disclosure, I’m a designer of sweater knits and I love what I do! What exactly is a sweater knit? All knits are fabrics that are made by interlooping of threads or yarn; that is, by pulling one loop of yarn through a previously made loop of yarn, row after row and column after column, depending on the type of knit. A sweater knit is made with a heavier yarn and bigger stitches than what you find in a standard t-shirt fabric. You'll know a sweater knit when you see one because the beautiful textures, often with quite complicated stitch patterns, immediately make you think “sweater”. Any color patterns in this type of knit are usually produced with different color yarns, as opposed to having the colors printed on the fabric. 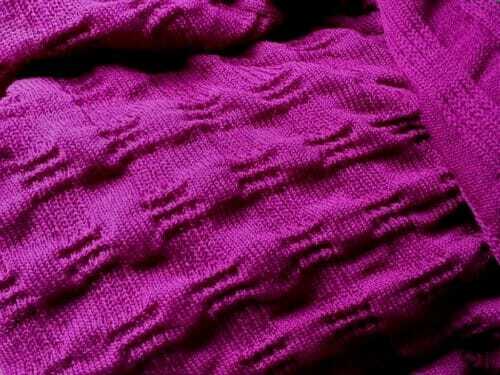 The sweater knits that you find at a fabric shop have all been made on industrial knitting machines. If you've never worked with sweater knits before, they can seem a little intimidating at first. Some, though not all sweater knits, can be surprisingly stretchy or unstable or thick. Those pretty stitches that make the fabrics so appealing need to be properly finished in order to prevent the fabric from fraying or running. 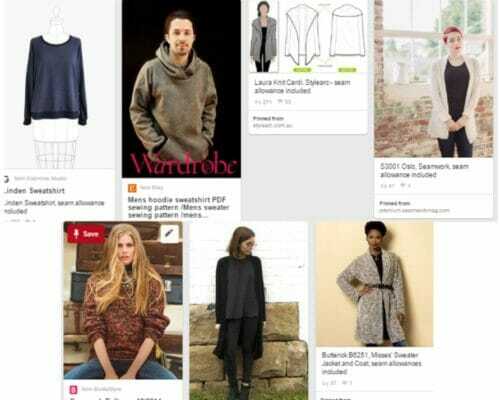 But once you’re familiar and comfortable with the basic properties of sweater knits and know how to work with them, the fabrics are lots of fun. Your reward is a beautiful sweater to keep or give. 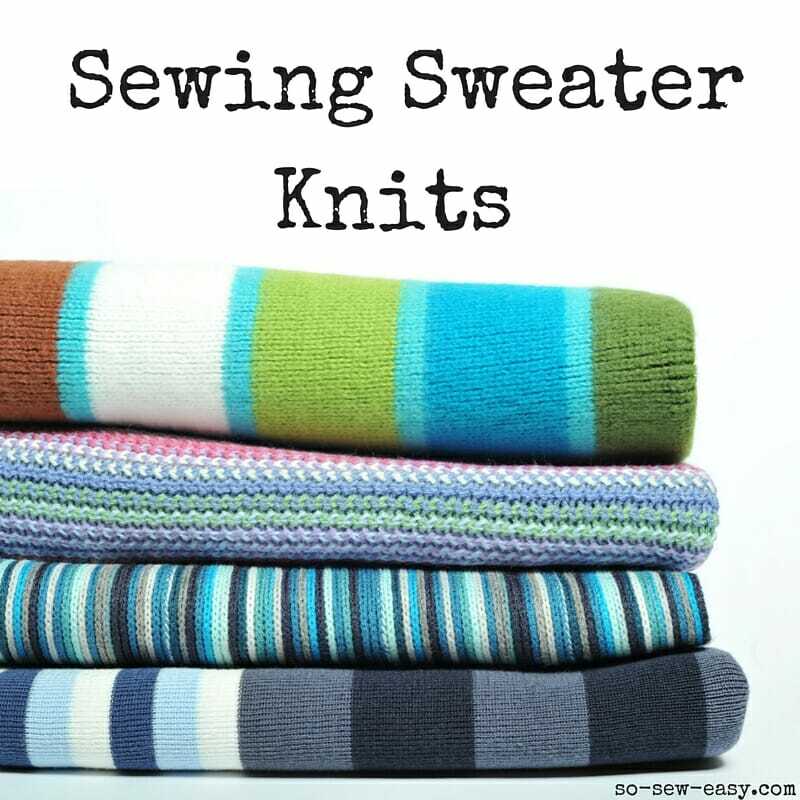 I hope these tips, grouped into four categories, will get you started on a creative sweater knit sewing journey! Before you even choose a sewing pattern, I highly recommend that you choose your fabric first. This may be opposite to the way you’re used to working, but your fabric may help in your choice of sewing pattern. (We’ll get to suitable sewing patterns later.) Choose a fabric that you love and get familiar with its basic qualities. If this is your first cut and sew sweater, look for a sweater knit that’s relatively stable and with a good amount of natural fiber, at least 55% cotton or wool, if possible. I’ve found cotton, wool, and linen are the easiest of natural fabric knits to sew. Fabrics that are primarily made of natural fibers work well with the steam from your iron. Though there are a couple of exceptions to the rule, when you work it’s best to hold your iron about a half inch above your sweater and allow steam from your iron to penetrate the fabric. This method will help preserve the stretch and texture of your fabric. Avoid applying pressure with a back and forth motion as you might do with a woven fabric. You’ll use this steaming method to make flat seams, hems, etc. If you’re just making a practice garment and feel more comfortable practicing with less expensive fabric, try your cutting and sewing techniques on a natural fiber sweater from the thrift shop rather than using 100% synthetic fabric. If you must use fabric with a high percentage of acrylic, polyester, or other synthetic, omit the steam and high heat, which could ruin this type of knit. Each sweater knit will have its own “personality”. Cut a small rectangle and fold over an edge. Get to know the fabric’s properties by stretching the fabric at the fold. Now fold and stretch in the direction perpendicular to your first fold. Make note of which direction stretches the most. Now stretch the cut edge a little. Now stretch the cut edge a bit more. Does it run easily? Probably not. Usually, only the laciest or slippery fabrics will run easily. Sweater knits just may be sturdier than you imagined! Use a ballpoint needle (sometimes called a “jersey” needle) of appropriate size for the weight of your fabric. Sewing with polyester thread and a narrow zigzag or stretch stitch is best for seams that need to stretch. I personally prefer the narrow zigzag, because the stitches are easy to remove if I need to change anything. If your sewing machine is refusing to sew sweater knits smoothly or wants to “do bad things” to your fabric, don’t panic. If you can, lessen the pressure of your presser foot. Some machines may need a little more help. Try these tips for smooth sewing and be sure to practice all settings on the test rectangle first! There are several good choices for edge finishes — bands, bindings, facings, hems. Your sewing pattern will provide instructions for this important step. When you become more comfortable with sweater knits, you may discover your absolute favorite finish and use that one all the time! Or you may want to diverge from the pattern instructions and swap out an edge finish just for the fun of it. Sweater knit seam allowances can be finished in a number of ways. They can be serged or overlocked. (Tip: If using a serger to finish a sweater knit seam, the differential feed setting will almost always need to be set to 1.5 or higher.) A serger is not mandatory. Some of my favorite finishes are actually made on a regular sewing machine! They can be zigzagged and trimmed, bound, topstitched, taped, or covered. We all know that finishing seam allowances makes the inside of any garment look nice, whether it’s made with a woven fabric or a knit. With a sweater knit, a finished seam allowance also protects the seams from fraying or running after repeated wearings and washings. No matter how you decide to finish your seam allowances, always practice on your the cutaways first. 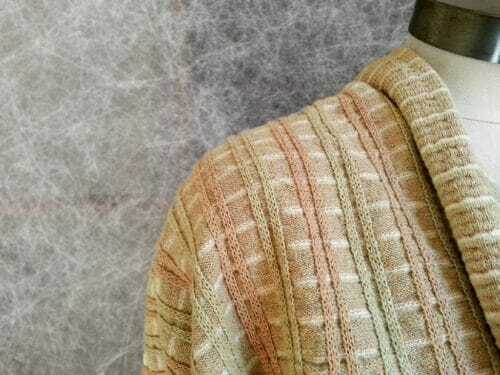 Like so much of sewing, there are many approaches when working with sweater knits, and there’s really no one “right” way of finishing a detail or accomplishing a task. The more you work with sweater knits, the better you get. 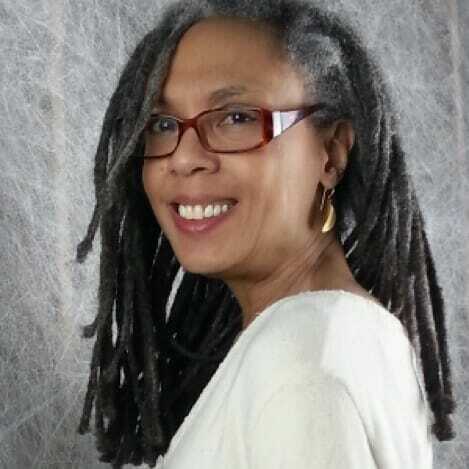 Enjoy the process of learning which techniques work best for you, your particular fabric, and your style. Use and modify these recommendations as needed in your own sweater sewing adventures. I would love to sew a tunic with patch pockets from chunky sweater knit. I feel like the inside of the garment would need to be stabilized before I sew the pockets on (so they don’t tear holes in the garment when they have a bit of weight in them) but I have no idea what to use. Any suggestions? I’ve always been afraid to “cut” the sweater fabric without it unraveling. Is this common, and if so, how do you prevent it between cutting and sewing? Depends on what you are doing but the best is to sew a straight line then cut, so the stitching will prevent the stitching from raveling. Great info on sweater knits! I truly enjoyed your article and have saved it for future reference. Thanks! Thanks for the tips: now I feel this is doable for me, so I definitely plan to try sewing knit fabrics for the first time! Great information! Making a proper “twin set” is on my wish list. Wow. So much detailed info. I’ve never really sewn much with sweater knits before but may give it a try now. Thanks so much. Thank you so very much for the information. I now feel a little more confident to try sewing knits. Great article, now where to buy those pretty sweater knits? At the bottom of the page is the link, check her blog the stuff Olgalyn designs is just beautiful and made in the USA.